Macera Taller Bar is a super hip cocktail bar located in the Malasaña neighborhood of Madrid. Macera sports a modern look with a granite bar top, huge liquor display and modern artwork. You would think you were out at a bar in the heart of New York City! 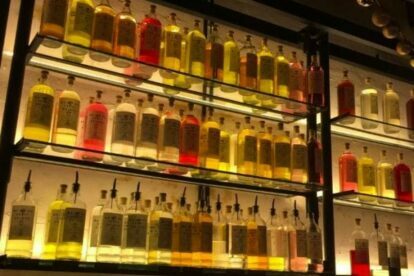 The coolest part about Macera is that they make and infuse their own liquor which they use in all of their cocktails! Macera gets their name from the term maceration which literally means the act of infusing liquors, beers or wines. Macera makes their own whiskey, gin, vodka and rum infused with a bunch of different ingredients, both familiar and different. These ingredients range from apples, oranges and red fruits to cinnamon, rosemary, almonds and thyme. When ordering there is a list of the infused liquors available organized by liquor type. For 7€ you can choose one to drink straight or mix with a soda or juice. In addition to this, Macera has their own cocktail list made up of drinks they’ve developed on their own. My favorite is the coffee-infused vodka with creme of café and actual espresso added! Macera offers both a chill and exciting atmosphere. If you want a more low-key experience, then it is recommended to go during the week or earlier during the weekends (before 22:30). On the other hand, if you want a busier experience, Macera will get packed with good people and music on the weekends after 22:30.